I was in the rainforest and not much was showing up so I put a tiny drop of honey on a rotting wooden post to see what would happen and the beetle showed up, then the ants showed up and the beetle ran away. It got to the rim of the rotting post and seemed to think twice about running and turned around to go back to the honey. Honey must be total nectar to the small creatures, bees being so protective of it. All the while I was shooting what I was seeing, from the best angle I could for DOF and aligning both creatures at the same time. A little exercise you could say. I took many shots and then decided on the arrangement to suit the story. The story was real but I couldn’t get the shots to tell it as it happened. When the beetle turned round to go back to the honey there was an ant waiting for it and it stopped it at each turn. It was at first cowed by the ant but didn’t give up on the honey. 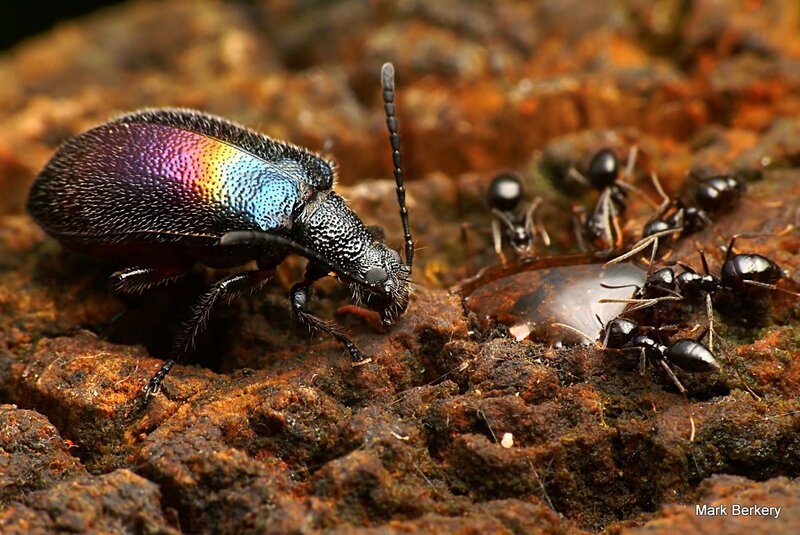 The ant even turned its behind to squirt formic acid at it to begin with but still the beetle came on. 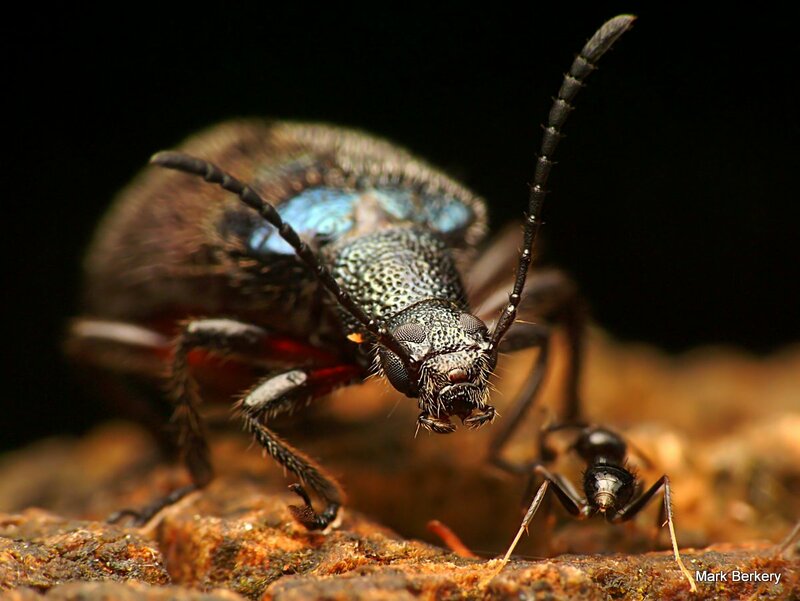 The beetle persisted passively and the ant gave eventually way until the beetle was back near the honey and the same ant appeared to be confronting it with a warning – ‘watch out mate’. Slowly but surely the beetle and the ants came to an unusual understanding and made a meal of the honey together, one on either side of the treasure. I suspect the ants just didn’t want a fight for the honey as there was enough to go round and better not to risk injury or death – survival being foremost of any creature. Nature always finds an intelligent balance. Great story, great pictures. Great photos. Accidentally clicked on your link in a story about stingless bees being conducted in Broome . How fortunate for me. Thanks. Nice shots, dude! Good to see another macro photog around here! You got spammed Matt, I rarely even look these days. Wonderful pictures:) And love the story. Always good to see sharing! Great pics and story! Thanks for posting! Mark, your photos are always amazing! Google originally led me to ‘beingmark.com’ when I googled the Raynox 250 over a year ago and I have been a keen follower since then! Surely this set of photos is not Raynox 250 results? I own the 150 and I believe that the 250 has an even a smaller dof. Thanks Maggie. It’s the 150 on the 250 on the FZ50’s zoom lens and gives me a comfortably short and constant working distance of around 2″ – depending on FL used. Hoi Mark very nice pictures of survival in nature. 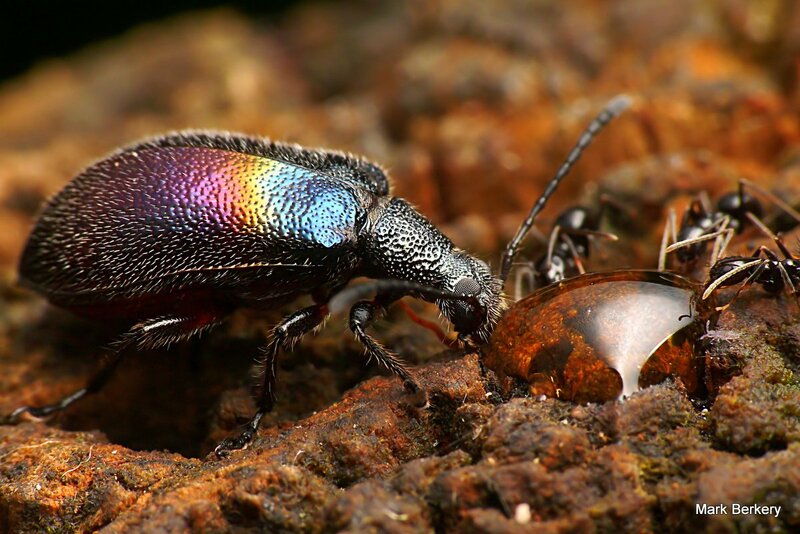 Can you tell me the name of that rainbow beetle it is a beauty.? Lovely…the photos, the story, and the moral…sort of a Berkery’s Fables?? Wonderful shots and observations as always. 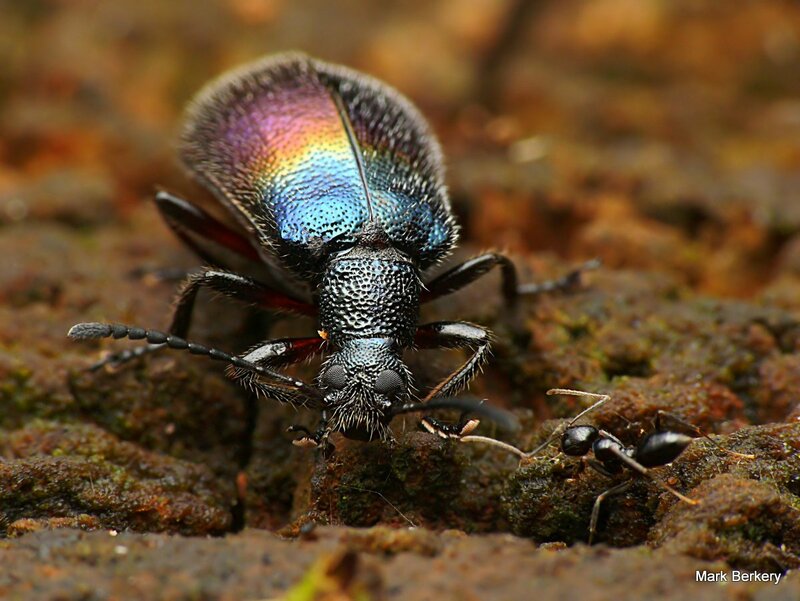 What a great looking beetle! Excellent series once again Mark. Wonderful :D both the story and the pics. It’s the little things that give the most pleasure. The honey was a big thing to these little things that give us pleasure. Very cool…the story you’ve captured! And the beetle is very good-looking. 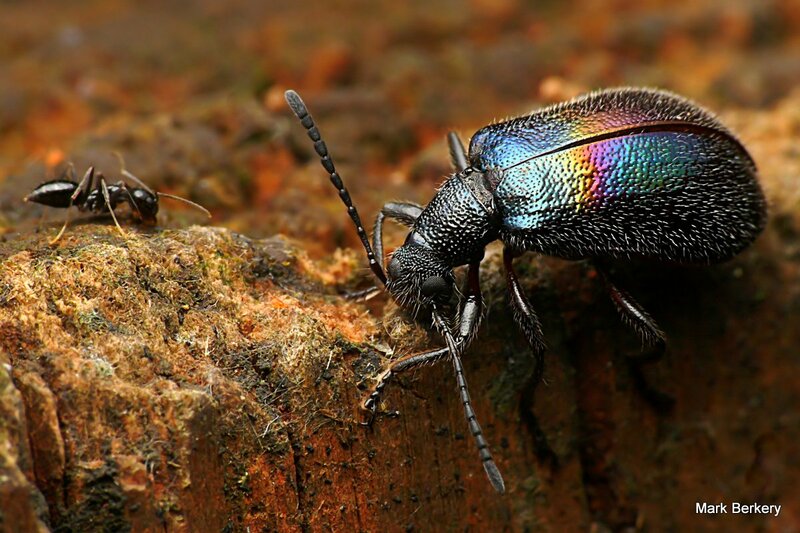 But for you, I would never know the gorgeous colors of some of these insects. Thank you! Incredible photos. Great story. What country are these taken in? Australia, Brisbane … in a nearby rainforest remnant. Thanks Alice. It is the ll version. Even with shallower dof this was probably easier than doing a dung beetle, less ground to cover.